Why stay at The Lavender Guest House? The Lavender Guest House is recommended by the English Tourism Council, and has been awarded with three stars, guaranteeing you high quality accommodation. We pride ourselves on having a very clean and comfortable hotel and have established a reputation for our superior hospitality. Please see our reviews on Trip Advisor from our many satisfied guests. We are located in the heart of Clapham Junction (Battersea) in a quiet residential area. Central London (Victoria or Waterloo) is only a ten minute train ride away, making us the ideal choice for your stay, whether you are on business or holiday. All rooms have flat screen televisions with free view channels and radio. We provide tea and coffee making facilities, towels, toiletries and hair dryers. An iron and ironing board are available on request. Our rooms are cleaned/serviced daily. We also supply free maps and have a great knowledge of London for tourists. We have a conservatory/lounge area in our garden with free wi-fi. This has a fridge and a microwave where you can prepare and eat your meal. 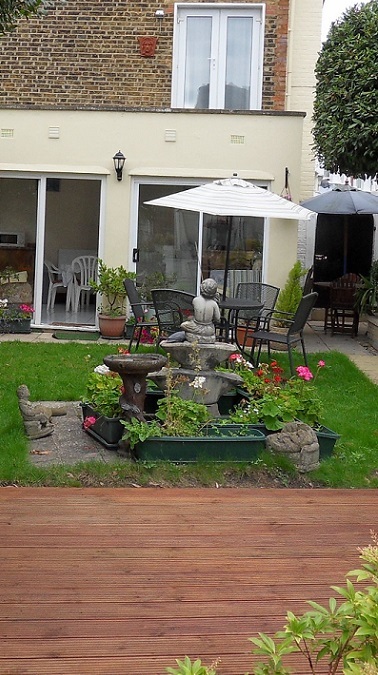 Alternatively, you may just prefer to sit and relax in our tranquil garden. Prices are for room only, we also provide free WI-FI. We accept cash on arrival. Unfortunately, we do not have facilities available to take payment via credit cards or debit cards. The Lavender Guest House looks forward to welcoming you through our doors.